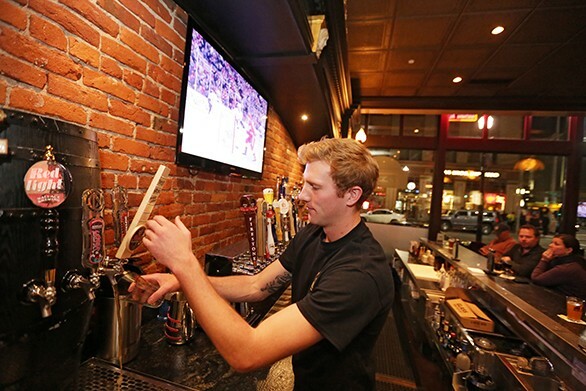 Bartender Levi Alford pours a beer at Post Street Ale House on Sunday. Sure, it's Wednesday, but arrival of hump day means we're more than halfway to the weekend. So in honor of the upcoming weekend why limit yourself to just dinner or a show, when you could do both? Here are a few non-culinary events happening tonight, coupled with a few nearby places participating in Spokane Restaurant Week. Yo Gabba Gabba Live Believe it or not, Yo Gabba Gabba is fun for both adults and kids, plus rap legend Biz Markie is now a band member. 6 pm • $26-$46 • All-ages • INB Performing Arts Center, 334 W. Spokane Falls Blvd. The Price is Right Live Here's a chance to win some prizes as part of a live audience — no studying required. 7:30 pm • $43-$53 • Martin Woldson Theater at The Fox, 1001 W. Sprague Ave.
Rakim with The Flying Spiders, St. Cule, DJ Freaky Fred Known as The God Emcee, Rakim is rumored to have collaborated with Pharrell and has harsh criticism for the lyrical content of current hip-hop. He wants to "lose the garbage and rebuild our scene." It'll be interesting to see him back this up. 8 pm • $25 • 21+ • Red Room Lounge, 521 W. Sprague Ave.